Franciszek Ksawery Lampi, also known as Franz Xaver Lampi (22 January 1782 – 22 July 1852), was a Polish Romantic painter born in Austria of ethnic Italian background. He was associated with the aristocratic circle of the late Stanisław II Augustus, the last Polish king before the foreign partitions of Poland. 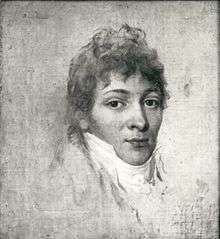 Lampi settled in Warsaw around 1815 at the age of 33, and established himself as the leading landscape and portrait artist in Congress Poland soon after Napoleon's defeat in Russia. Lampi was the son of renowned Italian historical painter Johann Baptist von Lampi the Elder from Romeno (b.1751) known as Jan Chrzciciel Lampi in Poland, who was invited to Warsaw by King Stanisław II August in 1786 when Franz (Franciszek) was 4 years old (or between 1788 and 1791, according to different source). He was born in Klagenfurt, where his father worked on commissions for the Austrian court. He was the younger brother of Johann Baptist von Lampi (b.1775), also a portrait painter in the Lampi family; and was initially taught painting by his father, before entering the Academy of Fine Arts Vienna in the studios of Hubert Maurer and Heinrich Füger. When he was 15 years old, the Lampi family relocated to St. Petersburg in 1797 during the third and final partition of Poland, enticed by an extremely generous offer from the Tsar. Estranged from his father, and disinherited, Franciszek Lampi left St. Petersburg at the age of 32 after the Napoleonic Wars, and settled in Warsaw a year later in 1815. The already well-established reputation of his father in Poland as well as his own Polish childhood helped him blend into society. He exhibited at Warsaw Salons in 1828, 1838, 1841 and 1845; and opened a small private art school in 1841. Lampi painted mostly aristocratic portraits and specialized in the Romantic depictions of attractive women. What's more, he produced fantastic landscapes and seascapes inspired by the new intellectual forces of the Age of Enlightenment and the philosophical evolution of Romanticism in Poland. His art style was similar to the work of Italian Salvator Rosa and Claude Joseph Vernet of France. He gave art classes in his studio, but also traveled. In 1817–1819 he was teaching in Kraków. Among his most notable students were Wojciech Korneli Stattler and Piotr Michałowski. In 1823 he went to Lublin on commission, in 1830 to Vilna. After the November Uprising against the Russian Empire he spent a few years in Wrocław (Breslau) before returning to Warsaw in 1836. In 1840 he visited Dresden, Berlin and Munich – known as Franz Xaver Ferdinand von Lampi in German. In 1850 Lampi returned to Warsaw where he died in 1852 at the age of 70, said to have been a possible victim of the cholera outbreak. His work can be found at the National Museum of Poland and its branches including Warsaw, Kraków, and Poznań. 1 2 "Franz Xaver Lampi (22 January 1782; 22 July 1852)". Oxford Grove Art. The Concise Grove Dictionary of Art. Oxford University Press. 2002. Retrieved October 29, 2012. Part of the Lampi family. ↑ "The National Museum in Warsaw". Museums. Culture.pl. Instytut Adama Mickiewicza. 2003. Retrieved October 29, 2012. See paragraph: King and eminent court personages by Baciarelli and Lampi. 1 2 3 4 5 Ewa Micke-Broniarek, Muzeum Narodowe w Warszawie (March 2005). "Franciszek Ksawery Lampi". Sztuki wizualne (in Polish). Instytut Adama Mickiewicza Culture.pl. Retrieved October 29, 2012. Note: to circumvent any forced redirect, copy-paste url into address box. 1 2 "Franciszek Ksawery Lampi (Klagenfurt 1782 - Warszawa 1852)". Bio with Index and Bibliography (in Polish). Pinakoteka Zascianek.pl. Retrieved October 29, 2012. ↑ Bryan, Michael (1889). Walter Armstrong and Robert Edmund Graves, ed. Dictionary of Painters and Engravers, Biographical and Critical. Original from Fogg Library, Digitized May 18, 2007. London: George Bell and Sons. p. 8 (Volume II L-Z). Retrieved October 29, 2012. 1 2 "Franciszek Ksawery Lampi (1782 - 1852)". Informacje o twórcy. Dom Aukcyjny Agra-Art. October 2012. Retrieved October 29, 2012. Skłócony z ojcem, w 1814 wyjechał na Węgry, skąd ok. 1815 przybył do Polski i zamieszkał w Warszawie. 1 2 3 4 "Franz Xaver Ferdinand von Lampi (1782-1852)". Portrait of Viennese Beauty, oil on canvas, 1820s. Boris Wilnitsky Fine Arts. Retrieved October 31, 2012. ↑ "Art Encyclopedia: Franz Xaver Lampi". Oxford Grove Art. Information from Answers.com. 2012. Retrieved October 29, 2012. 1 2 "Lampi family" (PDF). Österreichisches Biographisches Lexikon 1815-1950 (Online-Edition) (in German). Austrian Academy of Sciences Press. 2011. p. 420. Retrieved October 29, 2012. ↑ Magdalena Skrzyńska. "Franciszek Ksawery Lampi". Selected works. Artyzm.com. Retrieved November 4, 2012.